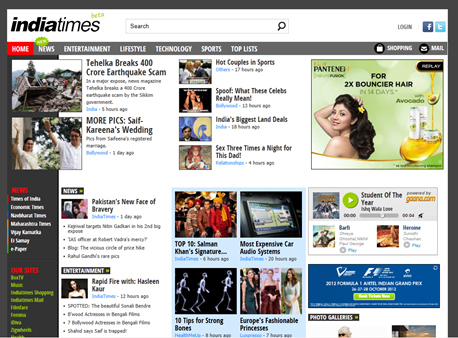 As a user and daily visitor, here are 3 reasons why the Indiatimes.com new look beta site doesn’t work for me. The page has too many elements fighting for my attention and I don’t know what to look at first. There are three columns on the page with partner plugs, reams of links, news content and advertising slots all mixed up with no immediately apparent demarcation. There is no hero slot that gives me the latest and top news items that I want to check out. Too many links and stories confuse me and the last thing I want to do is put in hard work to read through all the content on the page and select what I like. Also I have a short attention span and five scrolls of content and links don’t help. We have moved into an era of the visual web ref. the rise and rise of Pinterest. Videos and Photos play a key role in grabbing readers’ attention and keeping them engaged. The images on the beta site are pixelated and micro sized and I don’t instantly see links to galleries or videos on the first scroll. What do you think? Does the beta site work for you?